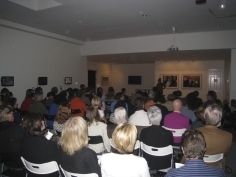 On October 15, 2009, the haudenschildGarage invited Washington Cucurto and Maria Gomez of the Argentine literary collective Eloisa Cartonera for a Garage Talk. 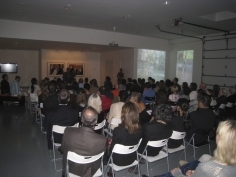 They were in conversation with Steve Fagin, Eloisa Haudenschild, Teddy Cruz (architect, estudio teddy cruz), Juli Carson (Director, UCI Art Gallery) Jennifer Flores-Sternad (art critic and curator), and Monica Jovanovich. 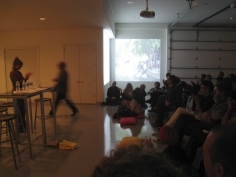 Steve Fagin and Juli Carson were moderators and respondents. 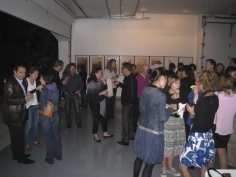 All of the October 15 participants were part of the November 2008 A Crime Has Many Stories traverse in Buenos Aires. 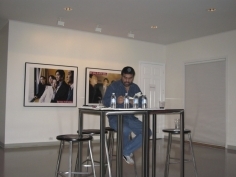 At the Garage Talk, Cucurto read an excerpt from the hG commissioned short story El Hijo. 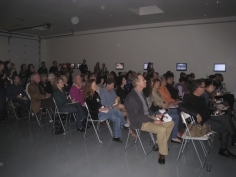 From October 14 - 16, 2009 Cucurto and Gomez were Artists-In-Residence at the haudenschildGarage. 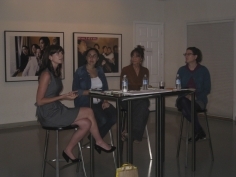 From October 16 - 18, 2008 Cucurto and Gomez traveled to Tijuana to present a lecture and a two-day workshop in conjunction with the haudenschildGarage, inSite, Nortestacion, Epicentrico and the Escuela de Artes de la Universidad Autonoma de Baja California. A Crime Has Many Stories, an exquisite corpse project commissioned and produced by Eloisa Haudenschild and Steve Fagin of the haudenschildGarage, was based on Argentine writer Ricardo Piglia's short story, La Loca y el Relato del Crimen (Madwoman and the Story of a Crime, 1975) set in Buenos Aires and plotted with co-conspirators Judi Werthein, Sonia Becce and Alejandro Ruiz. Piglia's text generated two site-specific pieces and a commissioned story by Argentine writer Washington Cucurto from Eloisa Cartonera. 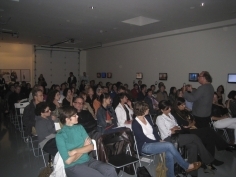 On November 29, 2008 a multidisciplinary, one-day extravaganza organized by Argentine producer Alejandro Ruiz began with a video of Ricardo Piglia's elegant interpretation of his own text performed especially for our event and premiered at Malba - Fundación Costantini (Museo de Arte Latinoamericano de Buenos Aires). We traveled from the opening of the project at Malba - Fundación Costantini to the closing celebration in La Boca by way of the projects by Jacoby, Laguna and Mirabella in a movable feast of culture and repast. The climax of our extravaganza was the inaugural performance of Washington Cucurto's savagely brilliant short story, El Hijo, commissioned by the haudenschildGarage in response to Piglia’s La Loca y el Relato del Crimen. 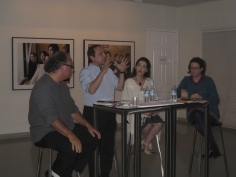 Cucurto and the literary collective Eloisa Cartonera performed an ensemble reading of the story in La Boca. A catalog of the entire project and a limited edition Survival Kit was provided to the participants at Malba to facilitate their journey. Both were produced in collaboration with Eloisa Cartonera.